Andres delivers an exceptional lesson experience and ranks in the top 15% of our teachers nationwide. 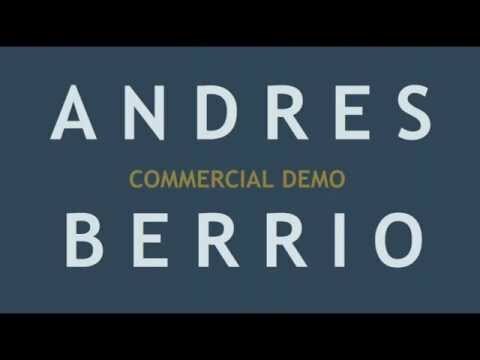 Andres Berrio – What Irresistible Sounds Like! Andres is represented by numerous talent agents throughout the United States and Canada and you can learn from him right here on Takelessons. He has recorded many commercials, industrials, narrations, training videos, internet videos, tv projects, educational scripts, IVR prompts, on-hold messages, tutorials, e-learning projects, audiobooks, promos, and telephony projects. Andres’s voice over type has been described as accessible, friendly, genuine, authentic, believable, guy next door, high energy, soft sell, hard sell, sincere, cool, hip, corporate, business like, relatable, sophisticated, knowledgeable, promo, urgent, and is consistently cast for a wide range of age requirements . . . male 20’s, 30’s, and 40’s. The U.S. Senate, Alina Health Systems, Northrop Grumman, Motorola, Medicomp Inc., LEFCO Worthington, Threshold Farm, Rice Energy, Cranberry Comfort Systems, Spotice, PCFC, and many many more! Northrop Grumman, Motorola, LEFCO Worthington, Threshold Farm, Rice Energy, Cranberry Comfort Systems, Spotice, ARKLA Adventist Academy, PCFC, and many many more!